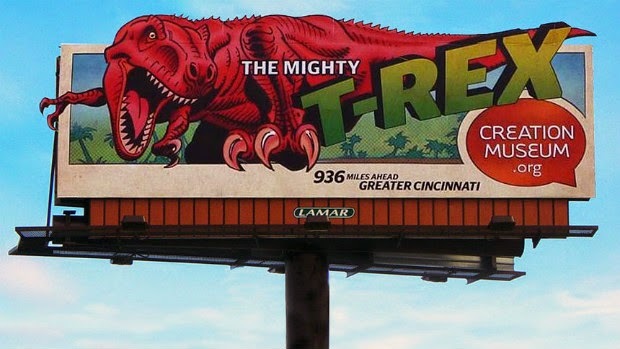 News of a creationist museum using billboards featuring cartoon dinosaurs (yes, that's religious dinosaurs using cartoon dinosaurs to preach fictional dinosaurs) prompted an interesting discussion on my Google+ page regarding interpretation of the Judeo-Christian creation story. The claim was made that the LDS Church (the largest Mormon denomination, of which I am a member) teaches there was no death prior to six thousand years ago, when Adam presumably left the Garden of Eden and became mortal. While some Mormon authorities have certainly taught such ideas, I reject literal interpretations of the creation story. A preponderance of convergent evidence from geology, astronomy, biology, anthropology and history demonstrates that the Earth is billions of years old, that humans evolved from less complex life forms, and that humans and our evolutionary ancestors have been dying the whole time as part of that evolutionary process. Does that mean I reject the Judeo-Christian creation story? No. Well, it must mean at least that I take the creation story less seriously than do other Mormons? No. To the contrary, I embrace the creation story in the most Mormon way! "Worlds without number have I created; and I also created them for mine own purpose; and by the Son I created them, which is mine Only Begotten. And the first man of all men have I called Adam, which is many." I want to focus on that last phrase: "Adam, which is many". There are at least two ways of interpreting this phrase, and both should give Mormons reason to reject fundamentalist Christian interpretations of the creation story. First, Adam may be many in the sense that Adam represents persons from each of innumerable worlds. Second, Adam may be many in the sense that Adam represents many persons in each world. These interpretations, and particularly the second, correlate well with Mormon temple rituals, in which participants take on the identity of Adam and Eve. Accordingly, as Mormons, we should think of Adam and Eve as many, as all humanity, emerging from the innocence of Eden both as a species and individually. Prior to our species evolving to a certain degree of mental complexity, and likewise prior to each of us maturing to a certain age, we could not conceptualize of death as we now do. The "fall" of Adam and Eve, then, is an increasingly emergent awareness of death, a growing knowledge of good and evil, and an assuming of moral agency. There was no death before the fall in this sense, although there certainly was death in the biological sense, as is more than sufficiently attested in the greatest of all God's records accessible to us: the Earth itself. "If Adam had not transgressed he would not have fallen, but he would have remained in the garden of Eden. And all things which were created must have remained in the same state in which they were after they were created; and they must have remained forever, and had no end. And they would have had no children; wherefore they would have remained in a state of innocence, having no joy, for they knew no misery; doing no good, for they knew no sin." "It must needs be, that there is an opposition in all things. If not so, my first-born in the wilderness, righteousness could not be brought to pass, neither wickedness, neither holiness nor misery, neither good nor bad. Wherefore, all things must needs be a compound in one; wherefore, if it should be one body it must needs remain as dead, having no life neither death, nor corruption nor incorruption, happiness nor misery, neither sense nor insensibility." Read it again. Seriously. Notice what the passage is claiming about contexts without opposition. Notice what it's claiming about environments such as the Garden of Eden, where there is no misery or death. The passage is saying that where there is no misery or death, there is no joy or life. That's right. For Mormons, as there was no death before the fall, THERE WAS NO LIFE BEFORE THE FALL! Indeed, there is neither sense nor insensibility before the fall. Again, this corresponds with the spiritual or psychological interpretation I provided above: before the fall, before our emergence from innocence as a species and individually, we could not conceptualize of life or death as we do now. That's what the creation story is about.